2016 is in full swing and it is almost February! Currently on my needles is the ambitious Timberline by Jared Flood. I am knitting this special sweater for my special gentleman in Blue Moon Fiber Arts Targhee Worsted in the colorway Deep Unrelenting Grey. I started both sleeves two-at-a-time, but quickly had to move them to individual cables because I realized after finishing the cuffs that I wouldn't be able to cross the cables on the back sleeve, doh! I'm still knitting them at the same time, which feels like it's taking forever, but progress is made, my tension will be the same for both sleeves, my increases will match without notes, and I won't get second sleeve syndrome! I am in love with the type of tubular cast-on taught in the pattern. It is simpler, faster, and less complicated than previous tubular cast-ons that I have used in the past. I want to make a blog post about the technique! The Targhee Worsted is simply perfect for this project. I had originally researched it for my future Pumpkin Ale by Ysolda Teague and had even purchased a sweaters quantity from the BMFA Barn Sale this year, so when I decided to bump Mike's sweater to top priority, I knew I would choose this yarn again. My swatches washed up beautifully with great stitch definition and lots of elasticity - perfect for cables. Both Timberline and Pumpkin Ale are heavily cabled, outerwear type cardigans so the decision made itself. The Targhee Worsted comes in large put-ups and in all the beautiful BMFA colorways so it's affordable and gorgeous - what is not to love?! Newly on my needles is the pattern Ondelette. It is a super long cabled cowl that you can drape around your neck or double up for extra warmth. It was published by one of my favorite local yarn stores, Twisted. It is rare, but I actually used the recommended yarn for this project. I have a deep and abiding affection for Madelinetosh Prairie and was thrilled to see the optimum combo of yarn and pattern. As a single ply, it can be tricky to use Prairie for intricate lace projects. 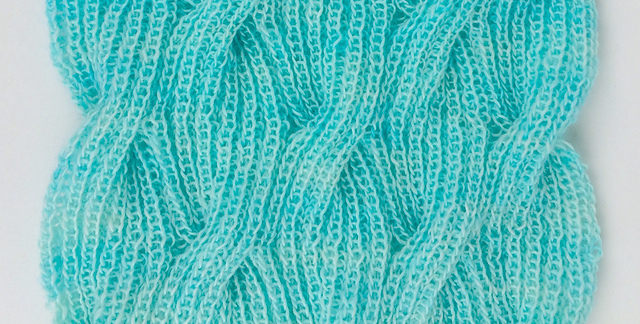 This scrumptious, fluffy cabled cowl is perfect for Prairie. The color way is Robin's Egg. I do believe I am becoming one of those people who have a color way in every base with this one! The cables are very large, 12 stitches held back, so I have to use a cable needle for the first time in years and years. The ribbing is not the fastest knitting, but it is perfectly mindless for late night relaxation or pub knitting! I look forward to pairing this with my plum coat this fall. At the Shetland Lace class in April, Gudrun had us knit this adorable mini shawl using traditional Shetland construction and lace techniques. It is a tiny version of her Flukra pattern. I think mine looks like a moth! I was happy to discover that the finished mini shawl is the perfect size for a Blythe head kerchief! I thoroughly enjoyed Gudrun's tales of life on the Shetland Isles, both modern and historical. The most fascinating subject was the traditional use of knitting belts. The crofter women would use the padded, perforated leather belts to support the weight of their knitting and free up their hands so they could knit at every opportunity. Can you imagine caring for children and gathering peat while knitting colorwork? Incredible! The best technique I took from the class was an appreciation for the unique construction of Shetland lace. The mini shawl was knit in three sections: first was the center triangle, knit from the center tip with yarn overs on the sides. The yarn overs were picked up and the middle lace panel was knit out. Then, the knit on border was attached to live stitches from the panel. It was a lot of fun to knit and rewarding to see almost immediate results on such a small project. You can read about the class and see photos on Happy Knits Blog. Can you spot me in the second photo? I can't wait to start on a full sized Shetland Lace shawl. I'm leaning towards Solan or Loren, both by Gudrun Johnston. Are they not beautiful? She had the samples in class and I fell for them! Thank you for the incredible opportunity, Gudrun & Happy Knits! Ysolda recently posted a video of Steven West knitting on her blog and on Instagram. I love to see the different ways people knit so I was inspired to join in! I am knitting a sleeve for my Amelie sweater, which I am still working on. I decided to do 3/4 length sleeves instead of short sleeves. On my first attempt, I decided to knit them two at a time, but it was a huge mess because I'm switching between two balls of yarn for each sleeve to prevent pooling. I ripped them back, untangled the mess and started again, one at a time! My recent crafting time has been spent sewing up batches of Parasol Doll Macaron Dresses! I started sewing for dolls when I was about 5 years old. When I discovered Blythe as an adult, I found the perfect muse for my handcrafting tendencies. I've been sewing and knitting for my personal doll collection for 10 years and my doll brand, Parasol Doll, is turning six this year! Designing dolly clothing has been a really rewarding part of my life. I have been inspired, creatively engaged, learned lots, and have made some of the greatest friends of all time!